Pay Per Lead | Pay for results not promises. Our Formula Delivers the ROI you need. …of all new clients continue to use our services after 12 months. A statistic we are proud of! Emedia Marketing are a UK Digital Marketing company who specialise in generating new enquiries and ‘selling opportunities’ for our clients on a ‘pay per lead’ basis. Unlike typical ‘lead companies’ who sell ‘leads’ to anyone who is prepared to buy them, we create unique inbound enquiries (Leads), addressed directly and personally to our client, from key decision makers looking to explore a solution for their requirements. This information is not shared outside the client we created it for. We are a company who have mastered generating new enquiries and opportunities for other companies using highly evolved and rehearsed techniques within the digital marketing landscape. We will represent you and reach out to your target market on your behalf. Our bills are derived from our success or failure and not our efforts. 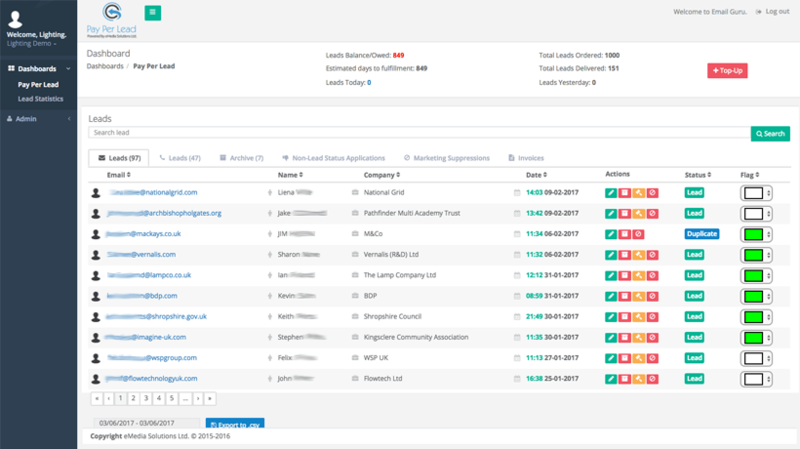 We have a proprietary database of around 1,300,000 of the UK’s most senior decision makers. This database is dynamic and connects with many external Data sources and is constantly changing and being updated. We collate all inbound communications across multiple sectors that we work within for segmentation. The data feeding back provides us with a very clear picture of where the hierarchy of responsibility lies within each organisation, and for each sector. Our work revolves around the continuous promotion of your businesses USP’s and strengths to the right people within the organisations we target on your behalf. Inbound enquiries receptive to your company’s unique proposition are presented to you as a lead. Our skills and ability to deliver quality enquiries has evolved from our experience of digital marketing within the UK business community over the last 15 years. Over those years a huge amount has changed and we have evolved with the times and perfected and refined our own marketing formulas which we apply when working for you. We are able to accurately estimate enquiry volumes prior to campaigns going live, which means we can offer our marketing services on a ‘pay per lead’ basis. We can also adjust the volumes of opportunities coming into you to suit your needs. 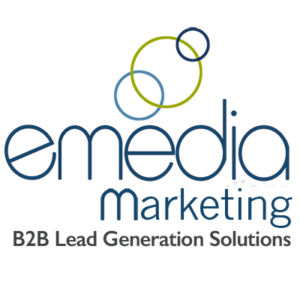 Emedia Solutions marketing services are a cost-effective outsourced outbound lead generation service. We are specialists at what we do and as such have a financially competitive edge over an in-house general Sales and Marketing team but more importantly allow your sales team to be more focused on what they do best…Selling! Sales role and sale process specialisation have been the key factor to some of the worlds fastest hyper-growth companies in the last 15 years. The formula follows the belief that a sales process requires the input of between 2 and 4 individuals each carrying out their part within this process extremely well opposed to one person attempting to do all parts of the process less efficiently when switching between roles. We are the first part. Our business model does not offer a solution for every business type, but for B2B companies wanting to grow and providing products and services on a UK wide national basis, we are able to provide a highly attractive marketing proposition & proposal. Our work creates active human engagement from your prospects with a clear call to action (to contact them) from an employee within an organisation by way of email, phone or Web enquiry, which offers a real opportunity for you to sell your products and/or services. Organise a trial campaign for your business today! We are a Marketing Company! A lead generation company works very differently. They do not represent you or your brand, or put forward your unique proposition, with all its USP’s, to a chosen identified section of the marketplace. 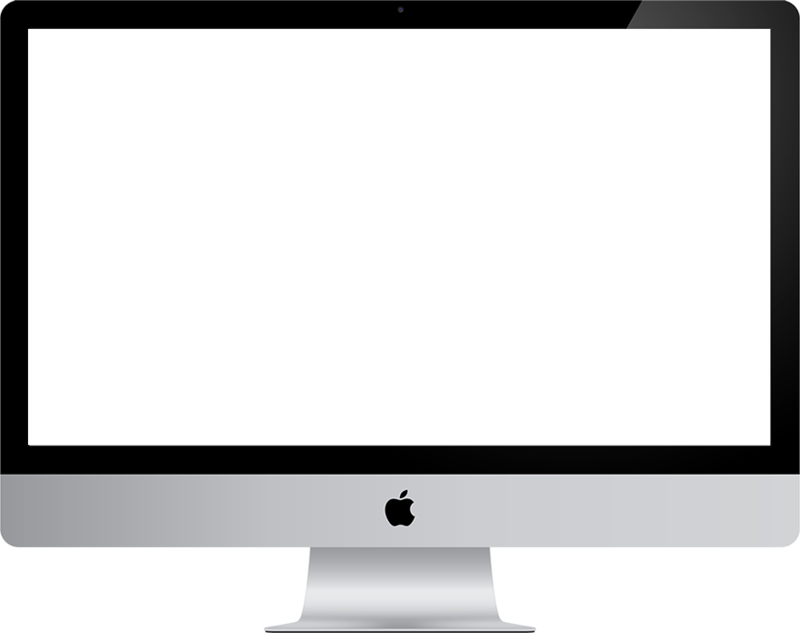 They often use web forms and blogging sites to attract inbound page views from all over the internet and harvest the web forms as leads. They will sell captured ‘field data’ as leads to as many people/companies as they can and negotiate as much or as little as people are prepared to pay for them. Conversion to sale is poor at best. Prospects are inundated with inbound callers from people and companies they have never heard of which turns the lead cold very quickly. Emedia Marketing. We represent you while communicating with your target market, and any campaign and its results are exclusively yours. All inbound enquiries are aimed at your Company, its representative (Whichever member of your staff you want the enquirer to engage with) and directly in response to the specific marketing material sent out. The buyer will be waiting for your contact and will be ready to share with you what interested them in your proposition. Our experience has proved that this model is the very best for a high conversion to sale. We do not charge set up fees, Consultancy fees, Copywriting fees, or any other fees associated with the online digital marketing of your products and services. You are only charged for the ‘selling opportunities’ that we create as a result of our work. You invest in our ability to provide you with prospects (leads) with solid requirements for your unique proposition within the marketplace. Strong Leads = High conversion rate. High Conversion rate = Great ROI & Increased Investment in our Services. This simple policy ensures and consolidates the long-term adoption of our services with you our client. Lead Exclusive to the Client it was Generated for ! We only work with a limited number of clients within each sector. In some sectors as few as 5 or 6 for a particular product or service. We can only generate a finite amount of enquiries over certain timeframes for each industry or sector. We try to avoid any conflict of interest by not creating competing campaigns between our clients. In some cases, this is simple as different companies even within the same sector can have very different propositions. We never disclose intelligence gathered or inbound information across clients. We work in the best interests of our clients and towards their continued success, and to that end, the information contained in their inbound enquiries is highly confidential and the intellectual property of the client that commissioned it. This is what separates us as a marketing company and not a Lead Generation company. Every client of ours is provided with a secure dashboard to help audit and manage the work we are doing for you. This is where we deliver all your new enquiries to as they arrive. An email notification is sent out the moment we receive an inbound enquiry for you. You log in and action the enquiry. Your dashboard shows a history of all your leads, and offers some great yet simple tools for ranking and sorting leads and adding notes to help with ongoing conversations over time. There is also an export feature so all leads can be downloaded into CSV format for use with other 3rd Party lead management tools. Our ‘Pay Per Lead’ pricing model means we can establish a return on investment figure very easily. Once you have a steady conversion rate, and you can establish the long-term value of each new client that we introduce to you, you can quickly calculate return on investment and build a growth strategy and a new client acquisition programme. We do not charge upfront fees (Encouraging?) and you are not under any contract. Our accounts department will take card information from you at the time of placing your initial order. You are billed the day following for any enquiries provided the day previously. Pay as you go. No enquiries = No Bill. To trial our services and see for yourself how our formulas and unique approach can your organisation call 01782 450445. We only need a minimum commitment of 12 enquiries to run a trial campaign. Over 88% of clients who trial with us go on to become regular users of our services. With the continued work and efforts in the growth of our proprietary databases we are continually expanding the lead volumes we are able to achieve within each sector. For availability in your sector, and if you’d like to discuss a trial campaign, please call 01782 450445. Why pay a marketing company when I already pay and employ salespeople? This is a common objection, and our response would be this. Marketing and Sales are closely linked but are certainly not the same role. A salesperson is and should be the most expensive component, a highly skilled communicator capable of instilling the confidence needed to a prospect, portraying your proposition in its best light and winning the sale. You want this ‘investment’ in front of selling opportunities for the highest percentage of their week as possible, making as many sales as possible. A salesperson who spends 80-90% of their week looking for an opportunity to sell is not working efficiently. With an abundant source of quality enquiries which can be increased or decreased on demand, we can keep your sales team motivated with a constant stream of inbound enquiries addressed directly to them. This dual investment will prove to be a highly profitable one. We can also engineer the amount of work we do to only supply enquiries at a rate you can deal with, ensuring no opportunity is wasted. A lead is an inbound engagement, by way of phone call or email, requiring or requesting you to engage with the enquirer with regard to their interest in the content of your/our outbound marketing campaign. This interest will be for the products and/or services you (our Client) provide. The requirement must be in the UK. The potential requirement must be within 12 months. “my company has literally doubled its turnover in the 18 months I have been dealing with you guys…” This was an extract from an email a client of ours sent into us. They provide bespoke Exhibition Stands to companies. They have grown their requirements with us over the last 18 months and are looking to grow further throughout the months and years to come. Transparent Pricing. No hidden costs. Pay only for Leads. Some example ‘costs per Lead’ can be seen below in some sample sectors. Below are some sample sectors that we work in. We work in many more. If your target marketplace is other businesses please call 01782 450445 to explore pricing for your business. How do I order leads and adjust my leads volume target? Once we have run through your initial trial, discuss with your account manager target volumes over set time periods. We will then engineer the amount of work we do for you to provide a constant sustainable volume of opportunities. This can be adjusted up or down as you require. It is worth mentioning that if you wish to remain a partner for the long term, it is best to provide sustainable work else during a long period of inactivity we might seek to replace the slot with a new partner. How do we generate our Enquiries? We target businesses throughout the UK who we believe could have a need for your products or services. We have established communication channels and use email in conjunction with our call centre to expose your business to the right people within your target market. We define your USP’s within our media and deliver web content to help build confidence and deliver information to companies interested in your proposition. The idea is to educate a prospect to such point that when they engage with you either by Phone, Email or Web form, providing the inbound engagement represents and constitutes a lead, it is added to your Dashboard. What type of companies do we work for? We have only 2 prerequisites. You must be able to provide your products and services nationally throughout the UK. 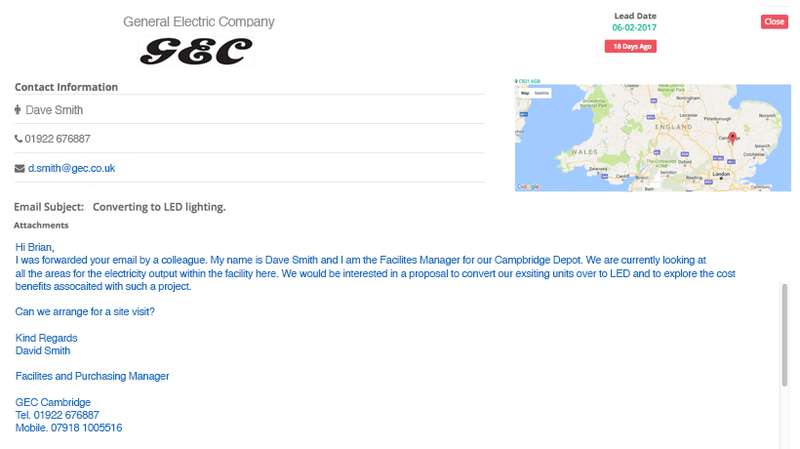 Our leads come in from all over the UK. Your products or services must be aimed at the business sector and not consumer. If you tick both of these boxes then our proposition will be extremely attractive when compared to other routes to market. Do you supply consumer leads as well as business leads? No, we only supply business enquiries, however, we have successfully marketed some high-end leisure products in the business community. Business owners and white collar workers can have a high demand for these types of products and service. What are your terms and how do I order a trial? Once you are ready to run a trial campaign, a campaign manager will discuss and agree on a strategy with you and give you an idea of potential lead volumes over a given time period. They will need an understanding of what type of enquiry we are trying to attract and will have agreed on a cost per lead for the campaign. Our accounts team will take card payment details from you to provide a billing mechanism for when your leads start to arrive. Although we can not guarantee to hit the exact number of leads per day requested, you will give your account manager an indication of target volumes required over a specified time period. The requested lead frequency is a guide and we monitor leads coming in overtime and adjust our work activity to try and accurately provide the leads in a timely manner. We run a trial campaign based on 12 enquiries. We do not charge upfront fees. Our accounts people will take card details from you at the time of ordering and you will be billed for the enquires as they arrive. There is infrastructure required, a strategy has to be planned and certain internal goals set. 12 enquiries is a minimum for you to calculate your ROI and the potential long-term value of our services. Emedia Solutions Ltd (T/A Emedia Marketing) Buxton House, Dawley Brook Road, Kingswinford, West Midlands.